While Donald Trump tries to frighten Americans into supporting his policies with the specter of real and imagined terrorism, the ostensible Commander-in-Chief has now gone a full week without scheduling a daily intelligence briefing. From the "Bowling Green Massacre" to "Atlanta" to the "Sweden Incident," no terrorist attack is too fictional for Donald Trump and his administration to use in order to frighten Americans into supporting their the Muslim ban or "Deportation Force." When it comes to actually doing the job of keeping Americans safe, though, Trump is very publicly leaving the country vulnerable. Last week, we reported that Trump had not received an intelligence briefing since the resignation and/or firing of disgraced National Security Advisor Michael Flynn. 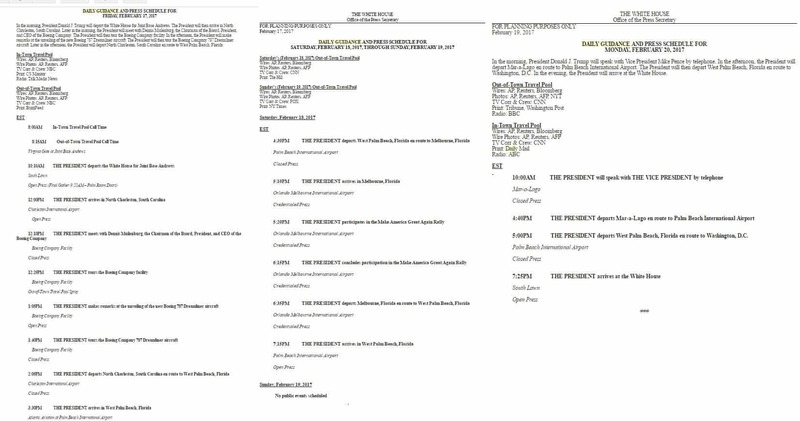 A review of Trump's daily schedules shows that there were no intelligence briefings scheduled for Friday, Saturday, Sunday, or Monday, either. As we have also previously reported, the value of Trump's re-branded intel briefings was already suspect, but now it has been a full week since Trump has received even that meager offering. Since Trump's schedules are public, this also means that our enemies may be aware that Trump is not being briefed. And that is not all: Our enemies also know that even when Trump was being briefed, he was more intent on promoting his daughter's business interests than paying attention to whatever was being told to him; they know that a good portion of those briefings relied on a man whom Trump knew to be compromised by a foreign government; they know that Trump conducts sensitive foreign policy crises in full public view of the members and staff of his Florida resort. Our enemies are aware that Trump was absent from the Situation Room during his first covert action as commander-in-chief, which he approved over dinner, that Trump lied about having a secret plan to defeat ISIS, and that he waited more than a week after taking office before asking his military advisors to come up with such a plan. With just a week to go until that plan is due, our enemies know that Trump is completely disengaged from the intelligence that will inform it. Our enemies know all of this, but sadly, the American people do not. Aside from the North Korea fiasco at Mar-a-Lago, the news media have largely been silent on Trump's gross dereliction.